Athens, Ga. – A new app wants to reward teens for not using the phone while driving. Created by students from the University of Georgia, the app recently took first place at the University of Pennsylvania’s Fels National Invitational Public Policy Challenge held March 24-26 in Philadelphia. The team-consisting of Master of Public Administration students Laura Pontari and Sara Richey, Doctor of Public Health student Hilary Carruthers, and Master of Public Health student Oluwatobi “Tobi” Olagunju-received $10,000 to complete the development of TurnKey, a mobile app designed to dissuade high school students from texting and driving. The TurnKey app uses behavioral economics such as positive reinforcements to encourage students to drive safer. For each minute a student does not interact with their phone while driving, they earn points that eventually earn them prizes. Higher performing students will have their names entered into a drawing each semester for the chance to win a larger grand prize. In addition, students who team up to participate in the app’s group competitions can claim awards that include bonus points or a group pizza party. W. David Bradford, George D. Busbee Chair in Public Policy in UGA’s School of Public and International Affairs, and Grace Bagwell Adams, assistant professor of health policy and management in the UGA College of Public Health, were the UGA team’s faculty sponsors. In collaboration with an app developer and the Athens-Clarke County School District, the TurnKey team will launch the pilot phase of the app at one Athens-area high school in fall 2017 and eventually span out to others. Once the app is launched more widely, the team believes this will result in 500 fewer accidents per year, with an average savings of $6,000 per accident. These savings would benefit the youth and their families, the broader community of drivers and pedestrians, and ultimately serve to bring down costs, including those for auto insurance, in the area. “We strongly believe that UGA can lead the nation in addressing teen texting while driving by developing TurnKey in collaboration with the Athens-Clarke County school system,” said Bradford. 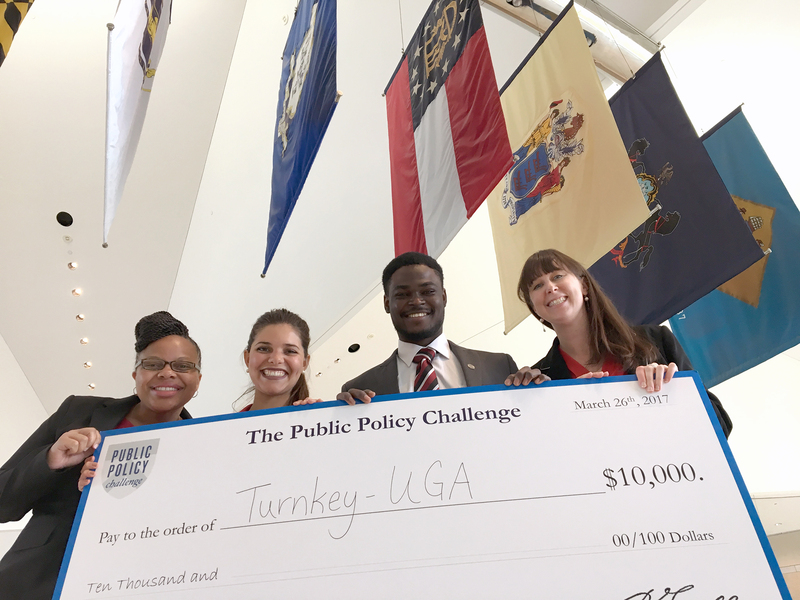 The TurnKey team brings home UGA’s second national win at the National Invitational Policy Challenge. Hosted by Penn’s Fels Institute of Government, the by-invitation-only policy competition challenges student teams to develop a comprehensive policy proposal and civic campaign plan addressing an issue specific to their university’s local community. UGA was among four schools named as semifinalists, including Georgetown University, University of Texas at Austin and University of Pennsylvania. More information on SPIA and the College of Public Health is available at http://spia.uga.edu and http://publichealth.uga.edu.